Your glass wine cellar or closet is more than just storage. It can be a centerpiece to your home, a conversation starter, and an opportunity to let your creativity show with a design that matches your tastes and style. It’s where form and function come together to give you a room you’ll enjoy for years to come. It’s a point of pride where friends and family can come together to enjoy good company, great conversation, and amazing wine. Do you have the right cooling system for your Orange County glass wine cellar? We get a lot of questions and requests about glass wine cellar cooling systems from Orange County homeowners and businesses. The beautiful, contemporary homes in the area are a perfect setting for a modern, glass enclosed storage system that does so much more than hold your collection. Glass is a wonderful material and an excellent choice for the walls and doors of a wine cellar or closet. 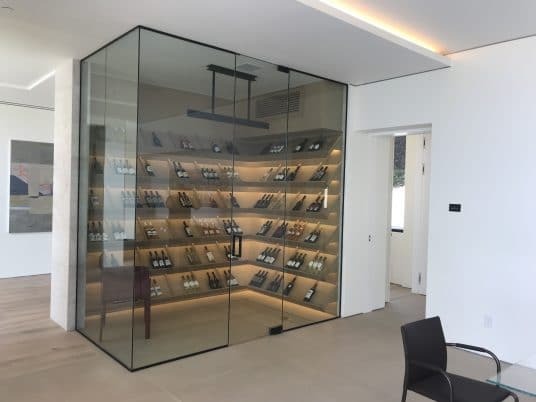 If your plan for a wine cellar or closet includes one or more glass walls, there are a number of considerations to keep in mind. M&M Cellar Systems was brought on to design and install the cooling units for these three glass-enclosed projects, and we were also able to weigh in on other design elements, like racking and shelving. Take a look! 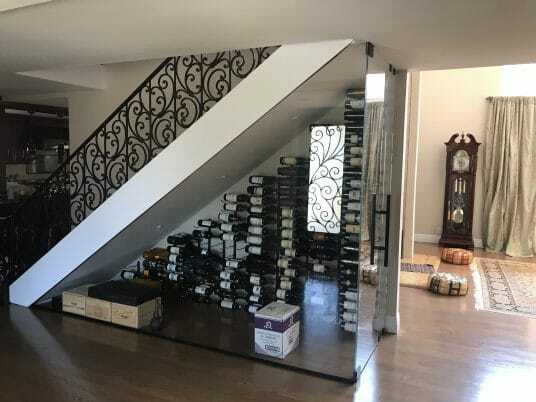 This glass enclosed wine cellar is a beautiful and practical use for an under stair area. In many homes, storage space can be tricky to find. This homeowner put the underused area under his stairs to great use by adding an elegant and practical glass wine closet. Efficient metal racking was used to allow for maximum storage and optimum display. These bottles are easy to organize, and the label-forward pegs make it easy to find the desired vintage. We wanted a clean look that show cased the wine bottles without cluttering up the area. We used a US Cellar Systems 6600 HS unit placed in the basement, a hidden duct behind the racking, and an air return where the floor meets the stairs. With this large glass wall and glass door, we need a more powerful system than would be required with traditional walls. We also recommended this racking to the owner, as it takes advantage of the large glass area, allowing maximum visibility of the labels. Another advantage of this “peg” type of racking is that it can hold over 300 bottles in this small space! A powerful US Cellar Systems unit keeps everything at the right temperature. 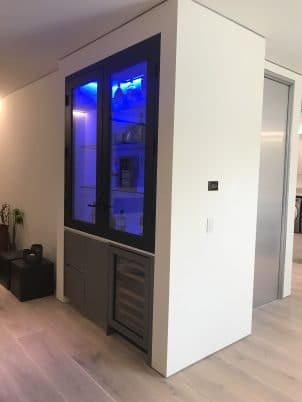 Temperature and humidity are primary considerations for all wine storage, and these glass wine cellar cooling systems for Orange County homes require extra care and foresight. With glass enclosures, we recommend using double pane walls, as they provide more reliable insulation and better temperature and humidity management. With single pane glass, as was used in this project, we don’t recommend letting the temperate get below 58 degrees. When the temperature gets below that mark, condensation can form on the glass. Water in an enclosed space like this can lead to mold, warped wood, rot, and other major problems. For Orange County homes that have glass wine cellars, we recommend keeping the cooling system set between 58 and 65 degrees Fahrenheit. Humidity in this area is usually not an issue for wine storage, so unless you have a specific need to maintain precise humidity, we just recommend keeping an eye on levels using a barometer. If you see a fog spot form on a glass wall or door, you’re close to condensation. Adjust your temperature level, and call us right away if the fog spot remains or grows. This is definitely a problem you want to correct before it becomes a serious issue. This blue-lit cabinet is a beautiful and modern addition to a contemporary sitting room. This gorgeous cabinet is actually split into four sections. In addition to appreciating excellent vintages of wine, this home owner is a tequila aficionado, and wanted a cabinet that could hold his tequila as well as a few wine bottles. Our solution was this cabinet. The owner enjoys his tequila chilled, so this top area maintains a 40 degree temperature – too cold for wine but just right for his tequila preference. 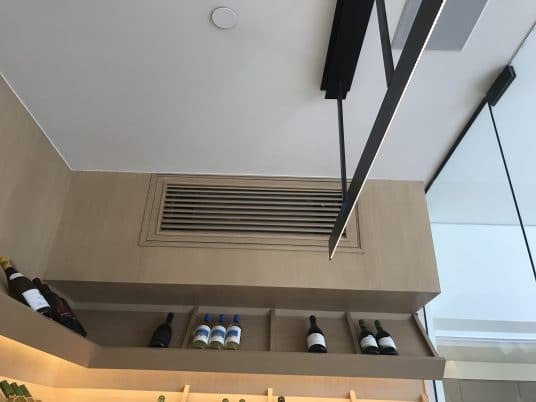 We chose an LPQ cooling unit from US Cellar Systems for this job, as its low profile and quiet operation were the perfect fit for this glass cabinet. 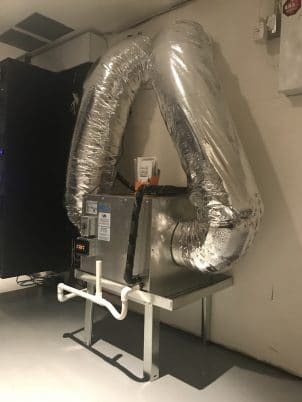 We treated this build just like any cooling system we install – we examined the space, considered the desired temperature, and chose the unit that would best fulfill the requirements. Storage units like this should last for years and years (with proper maintenance), so make sure you consult with experts so that your Orange County glass wine cellar, closet, or cabinet cooling system runs exactly the way you want it to. Underneath the tequila storage we added three more compartments: a stand-alone wine fridge on the right, an ice maker in the middle, a drawers on the left for holding glasses and other accessories. To finish the system we added a thermostat (the small black box to the right of the cabinet). Wine storage requires careful maintenance, so we always want to add an easy to read panel with easy to use controls. This gorgeous glass wine cellar is on the main floor of the home – a wonderful conversation starter! This main floor glass wine cellar is perfect for this Orange County wine connoisseur. They were more interested in a comfortable setting and a showcase for a few favorite selections, so visibility was the primary consideration for this storage room. We used an RM Coil for this room, as its design fit the needs of the space perfectly. A discrete duct near the ceiling maintains temperature for this glass-enclosed wine room. of wine bottles, and the design of this room reflected that. They selected slanted wooden shelving to match their flooring, with a style that allows for maximum visibility. A discrete duct near the ceiling brings in cool air without intruding into the room. Temperature and humidity are monitored via a thermostat on an opposite wall. Got Questions About a Glass Wine Cellar Cooling System for Your Orange County Home? Glass wine cellars, closets, and cabinets are a beautiful, contemporary and effective way to house your collection, but require proper design, installation, and maintenance in order to function properly and last for years. As you start to put your plans together, make sure you consult with the cooling system experts at M&M Cellar Systems. We are always happy to answer any questions you have regarding your wine storage. Mario Morales, our founder and lead technician has over 12 years of experience in the wine cellar industry and is ready to answer your questions. With our extensive network of designers and builders, we can help you realize your wine storage dreams and create and cool the glass wine cellar you’ve dreamed of. We proudly service Orange County, and the greater Los Angeles area. Call us today at (323) 578-3330 or click here to get started!